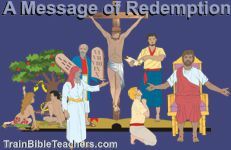 The time teachers have with students to communicate eternal truth in a given week is minimal. Every tool available to them should therefore be used effectively, including bulletin boards. Bulletin Boards: An Old Method Still a Viable Tool? It's Just a Bulletin Board? This three page handout for teachers an acrostic of the word SUPER to look at elements that should be considered in making a bulletin board. The first page of the handout gives general guidelines that could apply to any kind of bulletin board. The second page provides suggestions for making it interactive. The third page looks at seasonal bulletin boards. While students could benefit by simply reading the handout, it could be used as an evaluation tool of an existing bulletin board. Or, you could ask teachers to design a thumbnail sketch of a bulletin board keeping these points in mind and then sit down together to evaluate it using the guidelines in the handout.